My son, who is studying the history of art at A level, recently asked me what one picture I would take with me to my desert island. And why. Although the first question is difficult enough, the second is perhaps harder still. 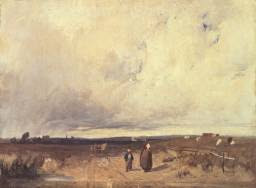 I thought of pictures by Bonington, Cotman, Ruisdael, Constable and Turner, all of them close to my heart. Interesting choice of phrase, “close to my heart”. These pictures all meant something to me long ago, in my teens or early twenties, when my heart was perhaps more labile, so their attaching themselves was all the more impressive. And they are landscapes. And sky-dominated landscapes at that (think of Bonington’s A Distant View of St Omer at the Tate), [above]. This attests to a fundamentally romantic temperament, which I won't deny. But one gets on. Horrible generalisation, this, but as one grows older one grows away from self-absorption. Other people come to interest you in their own right, not simply as extensions of your own consciousness. Gazing into the sky and dreaming has its moments and attractions, but perhaps people are more interesting still. There is a picture at Kenwood House that I love (and would have dismissed when young as terribly stuffy and dull) Mary, Countess Howe by Thomas Gainsborough. And another, at the Wallace, a kind of sister painting, Nelly O’Brien by Joshua Reynolds. But it is another picture at Kenwood that I would choose. It is my favourite painting by quite some way. Why? Immediately I said “I like the colours”. This was flip, but there is something in it. When I look at this painting I think of Shakespeare. I see a kind of benevolent omniscience, even in these very colours (to be pat: the red is life, the dark is death and the palette of the picture ranges through every tone between them, so there is deep sadness but also laughter here). I feel I am in the presence of someone I can trust. The famously mysterious circles behind the artist merely suggest to me that element of being that remains unknowable. 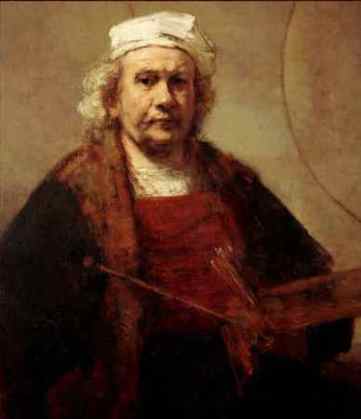 Rembrandt painted scores of self-portraits and yet there is in none of them even the hint of vanity. It is as though the artist genuinely sees himself from without, objectively (though he surely was not attempting to portray his own benevolent omniscience). This, I think, is the best of all those renditions of himself. He is an old man, bankrupt, his wife and son both fatally ill, and yet here he turns this negative experience to positive effect in a picture both pathetic and proud. The figure in the picture has so clearly experienced life, in the sense of having, like Socrates, examined it thoroughly. I wouldn’t be so lonely on my desert island, with Rembrandt hanging from the palm tree, and that is why I’m taking him with me. I imagine there'll be plenty of skyscape to stare wistfully into. Have just come across a page in The New Yorker, here, that may be of interest (the portrait is on loan to the Metropolitan Museum at the moment).